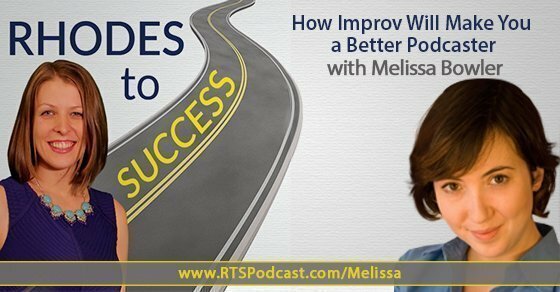 On this episode of Rhodes to Success, I interview Melissa Bowler, who is the Executive Director of a non-profit organization called P.I.G., aka the Providence Improv Guild. P.I.G. is an organization dedicated to building a community of improvisers and providing affordable improv workshops to a wide audience. During this episode, we cover how entrepreneurs, business leaders, speakers, and podcasters can use improv training to better themselves and communication. What is the definition of improv? How can people use improv into their business? How can business owners with a virtual team engage you in improv training? Improv (improvisation) is the art of making things up on the spot. Live improv shows are essentially sketch comedy that is written, directed, staged, and executed in the moment based on audience suggestions. When it comes to improv, there is a beauty in not knowing what is going to happen. When you do improv, you go on stage completely blank and let things happen. The human ability to improvise is innate and is something we knew how to do at one point in our lives. Improvisation is about uncovering the idea of play that is in all of us. Some questions don’t apply to all guests. You have to go where if feels right to go and not just on the run sheet. Podcasting allows you to do improv during the recording but edit things out. Hire an expert to teach a class. The most effective is in-person. Take a class and pass on what you learn. Incorporate the spirit into your work. Having a sense of humor and the ability to connect with others gets you so much further in life than knowing all the intricate business rules. The business climate and world is changing, which allows for a connection on a more human level. You always have to accept an offer and use the ‘Yes, and…’ approach. This means accepting and building. ‘Yes, and…’ allows you to discover a lot of bad ideas and explore them. In every bad idea there is a grain of a good idea within it. You have to say, ‘Yes, and…’ to get to the good idea.